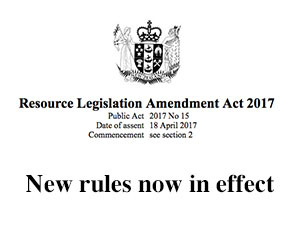 The Ministry for the Environment has announced that a range of changes to the RMA and Conservation Act, made through the Resource Legislation Amendment Act 2017, are in force as of Wednesday 18 October 2017. Some changes came into force immediately after the Bill was passed into law in April this year. However, a number of other changes had a delayed commencement, to allow councils and others to update their systems and processes. better alignment of concessions under the Conservation Act with resource consent processes for councils that are to meet the two-year timeframe, councils must apply to the Minister for the Environment for an extension. Information about the range of changes can be found on the MfE website. The changes do not affect ongoing statutory processes that were initiated before commencement of these changes; see the transitional and savings provisions set out in clause 12 of Schedule 12 of the RMA for details.